Sunflowers, a member of the aster family native to North America, were, and still are, cultivated for their oil and their edible seeds. Sunflowers today are very hardy and will grow well with full sun in most types of disturbed soils. Wild sunflowers thrive on cultivated ground, low meadows, prairies, and along roadsides and railroads. Their many small heads flower from July to September, the seeds ripening into October. Domesticated sunflowers have one or a few heads. 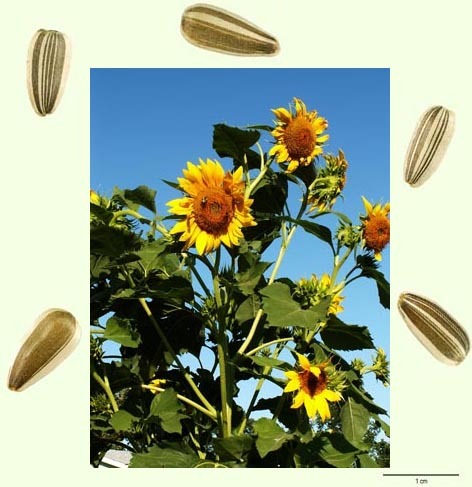 The earliest archaeological evidence for domesticated sunflowers in eastern North America comes from Tennessee where they are dated at 4900 year ago. Most researchers believe that sunflowers make a good case for a separate and independent origin of agriculture in eastern North America. The first domestication probably came about as the result of early peoples selecting and planting the largest seeds from wild plants— plants with the largest heads or seeds that remained on the head after the plant reached maturity. Eventually early gardeners gradually increased the seed size by 1,000 percent. 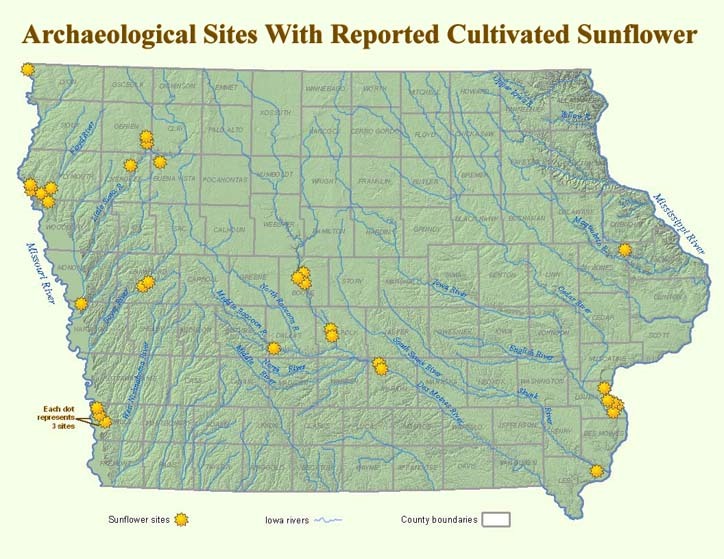 Sunflowers were cultivated in Iowa perhaps as early as 4000 year old when they appear in the Late Archaic occupation at the Sand Run West site in Louisa County. Thereafter, they occur commonly in Woodland through Late Prehistoric Great Oasis, Mill Creek, Glenwood, and Oneota sites. 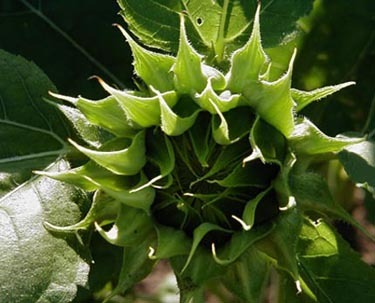 In historic times, native peoples utilized all parts of the sunflower plant for food, medicine, ceremony, decoration, and utilitarian purposes. Seeds, high in fat, protein, and calories, were boiled to extract the oil and parched and ground to make a meal or flour. The stem of the plant was used to make animal snares, candles, and fire sticks.